Hear every word, lyric or beat with rich, crystal-clear sound by AKG. 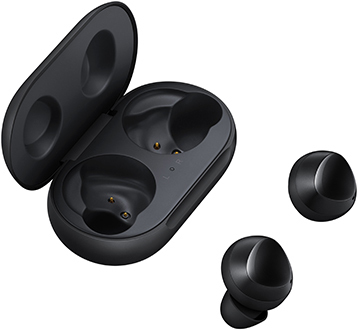 The compact and ergonomic design of Galaxy Buds make them comfortable enough to wear all day. You can wear your earbuds during your toughest workouts, thanks to splash resistance IPX3 protection. With a pocket-sized charging carrying case, it’s easy to carry your Buds with you while charging. Enjoy up to 6 hours of true wireless musical freedom, and wear your Buds anywhere the day takes you. Hassle-free Bluetooth connection means you can easily connect with all of your devices. 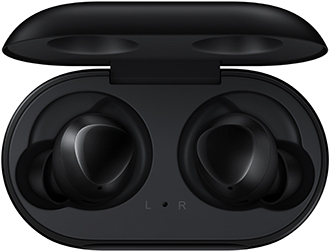 Let outside sound in without removing your Galaxy Buds, so you can stay connected to the world around you. Dual microphones make background noise a thing of the past and ensure your voice is heard loud and clear.